If you are looking for an unconventional tourist destination from Jaipur, this weekend, then it is advisable to plan a tour of Pilani. Famous for the prestigious Birla Institute of Technology and Science, Pilani is known as the city of education. Even though there are not many places to explore here, it still makes for a great weekend getaway on account of the presence of temples and gardens. Pilani is located in the Jhunjhunu district of Rajasthan and its history stretches back to the period of the epic Ramayana. As per this ancient text, it is believed to be the place where Lord Rama stayed during his exile with his brother, Lakshman, and wife, Sita. Therefore, it is home to several temples and religious sites today. So, what do you think of spending your weekend at this historic site which has gained popularity as the city of education over a period of time? If you would love to be at such places, then plan a trip from Jaipur to Pilani now. Read on to know more about how to reach Pilani and its tourist destinations. Pilani experiences an extreme type of climate and therefore, the weather is hot here during the summer season. The best time to visit Pilani is from October until the end of February. During this period, the weather is cool and pleasant, thereby, letting you roam around and explore its tourist places comfortably. By Air: The nearest airport to Pilani is located in Jaipur and hence, there is no option available to reach Pilani by air when you are starting your journey at Jaipur. By Rail: Chirawa railway station is the nearest railhead to Pilani at a distance of about 16 km. However, there are no direct trains available to Chirawa. Therefore, you need to take a train from Jaipur to Rewari and then from there, another train to Chirawa. Once you have reached the Chirawa railway station, you can hire a cab to reach Pilani. By Road: Pilani has a good network of roads and hence, you can easily approach it by road. As route 1 will take half an hour lesser in comparison to the other route, thereby, taking you to your destination within 4 h 30 min, it is the preferred route from Jaipur. On your way, you can take a break at Chomu and explore its beautiful historical monuments. Chomu is located at a distance of about 40 km from Jaipur and 170 km from Pilani and is famous amongst tourists on account of the presence of the 300-year-old Samode Palace, which is also a destination for several filmmakers. There are several ancient temples and religious sites located within its boundaries which are frequented by several Hindu devotees and seasonal tourists. 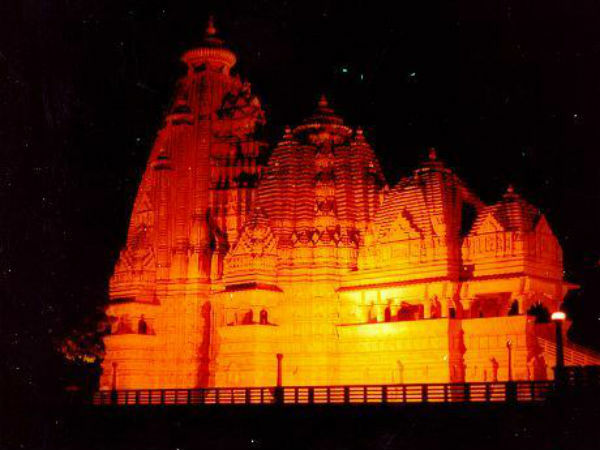 The most prominent one amongst them is Shri Samod Balaji Temple. The temple is a highly revered religious site and is a perfect place to feel a peaceful environment. Pilani is located at a distance of about 200 km from Jaipur and is a perfect place for those who are looking forward to getting themselves at unconventional unexplored places. As Pilani is not a popular tourist destination, it is only visited by local tourists. Hence, you can also enjoy its uncrowded environment. Even though the town is famous for BITS Pilani, there are several other places within its boundaries which will certainly interest you. Following are the major places which you must on your trip to Pilani. If you love science and technology, then Birla Museum is your destination here. It is the located in the Vidya Vihar campus of BITS and is visited by hundreds of tourists every year. From learning about interesting theories on physics to witnessing scientific equipment, there is a lot to do in this wonderful museum. If you desire to learn about the principles of science and how this world is based on them, then Birla Museum should be on your bucket list. The most popular and the most visited site in Pilani, Sharda Temple is a 20th-century temple dedicated to Goddess Saraswati, the goddess of knowledge, and is built out of white marble. It is also located in the Vidya Vihar campus of BITS and was built by G.D. Birla, an Indian industrialist and philanthropist. Today, the temple is a highly revered site in the city and is a must-visit spot in Pilani. Yes, Panchvati is the place where Lord Rama stayed with Goddess Sita and Lord Lakshman during their exile of 14 years. It is also the place where Goddess Sita was abducted by the demon king Ravana. Today, Panchvati is covered with beautiful trees and lush green lawns, which in turn, offer its visitors a serene aura. You must visit this age-old site if you love exploring the history of any place. Do you get fascinated by Indian mythology and its interesting stories? If yes, then you should not miss out on this beautiful spot which has a lot to be explored. Well, your journey to Pilani doesn't end after witnessing the above-discussed places. There are several other places in this education city which will certainly allure you. The list includes Shiv Ganga, a beautiful park and the beautiful campus of BITS Pilani.